For most of us, moving is a huge headache - packing, unpacking, sorting, arranging. But for the outgoing and incoming first families, according to CBS News Senior White House Correspondent Bill Plante - not so much! It all happens for them over the space of six hours while they're busy with the inauguration and the parade. When the president and president-elect leave the White House Tuesday morning on their way to Captiol Hill - as happened with Bill Clinton and George Bush eight years ago - a team of almost 100 people will swing into action - organized chaos, says former White House Chief Usher Gary Walters, who held that position for 21 years. "It's a bit of a delicate ballet," Walters say, "but everybody has certain projects or functions that they're supposed to do during that time." When the president-elect first visits the White House, the head usher is ready with briefing books and questions for the new tenant, questions, says Walters, such as "which furniture they want in place, are they gonna have house guests that first night, are there family members who are gonna be sleeping here?" 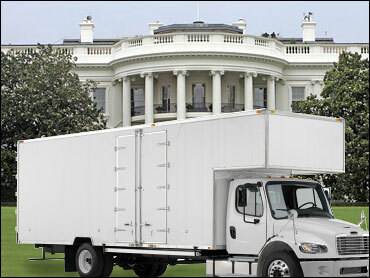 The Bushes actually began moving out over the summer, so they won't even need a truck Tuesday. "They didn't come with a lot of things; they didn't bring a lot of furniture here," notes outgoing White House Press Secretary Dana Perino. That will allow some extra time for the Obama White House extreme make over, Plante observes, accomplished by White House staffers in just six hours. "They want to put different art, they want to put the pictures, obviously, of their own family," Walters says. Moving into the White House is bound to be an adjustment, but, says presidential historian and CBS News consultant David Brinkley, it's well-cushioned. "They're gaining the Camp David retreat, a huge White House, access to Blair House, non-stop limo service, cooks, valets, servants; our country provides a lot to our president." For the Bushes, Plante adds, the final goodbye to the White House staff they've come to know over eight years will come just before the Obamas arrive for coffee Tuesday. Send your pictures, videos and e-mails on Inauguration Day activities to Natali Del Conte Tuesday morning, at obama@cbseyemobile.com. If you're on twitter, you can "tweet" us at Twitter.com/TheEarlyShow. To see the CBSNews.com Special Report: Inauguration '09," click here.